The story behind "Street vendor in Istanbul, Turkey & Shop Digital Direct, Broadway photo and other scam shops warning." Istanbul is a wonderful city, spread out over two continents. The people are friendly and the cultural and religious mix found here is unique and refreshing. 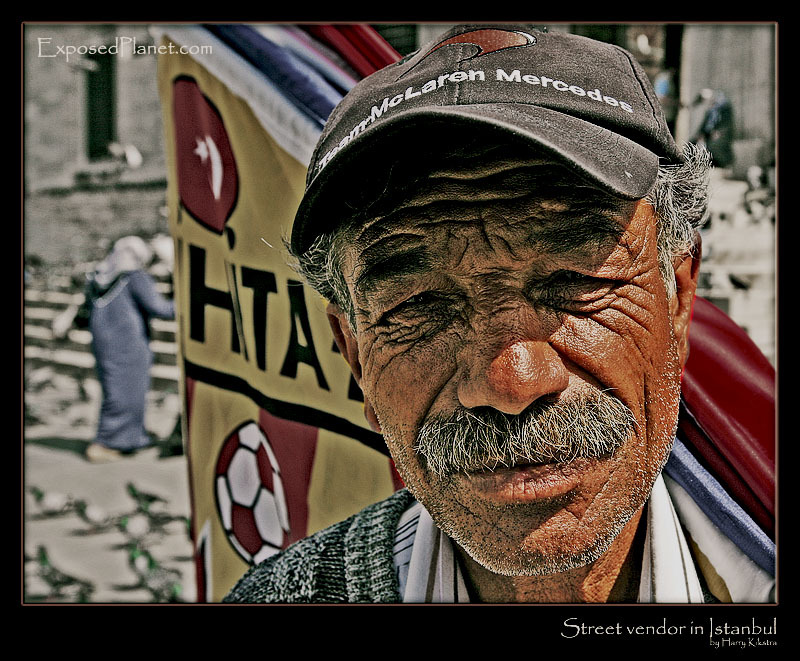 Of course this attracts many tourists and thus also many street vendors, selling food and souvenirs, like the friendly man pictured above, selling flags in front of one of the main mosques. One day I might turn this photoblog in a more detailed photography blog, for now I will just use this every now and then to give some tips, that might help other photographers. When looking for availability on the new and long anticipated Canon Eos 5D, Mark II (or mk ii, mk2, mark2 etc), which has a MSRP of $2700, I noticed some very good deals, even up to 35% lower than the suggested retail pricing at a shop called Shop Digital Direct. It even came up on some of the price comparisons sites!. – Credit Card fraud: They will actually charge you even more than agreed, even after the ‘upselling’ as per above. Always check your credit card statements, as basiscally you give them unlimited charges on your card. Many clients of these stores also have rported that suddenly their CC was abused, so likely these criminals simply sell your credit card details to other hoodlums. – Restocking, shipping and insurance fees: Before you actua;ly get anything (if you ever get anything), you will be charged ridiculous shipping and insurance fees, while it still takes weeks to get your -uninsured- camera. Whether you get the ‘full package’ or the basic offer, you will be 100% dissatisfied, as they never ship out what they promise, add crappy tripods, 3rd party lenses etc. So you try to call and send it back. By then your Credit Card is already charged and they will tell you that they will charge 20% restocking fee if you send things back. Bottomline: only buy from reputable online shops, like Adorama, Pictureline, B&H, Abes of Maine. Even when not in doubt, check their rating at the website Resellerratings.com. Note 1: Be aware that though Amazon is a great shop, some of its ‘3rd party sellers’ are outside their control and might be scammers. Same is true for genuine price comparison sites that might show you criminal sites as the cheapest, all is automated, so always check the site out before you buy. The most famous ‘shop’ acts under different names: Broadway Photo / A&M Photo World, Regal Camera, Prestige Camera, Preferred Photo, Royal Camera, more (Homepage: http://www.bwayphoto.com/). Others include but are not limited to Broadway Photo / A&M Photo World, Regal Camera, Prestige Camera, Preferred Photo, Royal Camera, Express Cameras / expresscamera.com / Save Here Distribution, Best Price Cameras (enterprisephoto.com, infinitiphoto.com, jandkcameras.com), USA Photo Nation (RadioActiveDeals, expecam.com, RainbowTronics). Buyaib.com (aka ALPHA INTERNATIONAL BUSINESS, INC.
Accubyte, ATXcases.com (aka Colorcases.com), Stargate Photo / WawaDigital / The Camera Wiz, Royal Camera / A&M Photo World, CCI Camera City (also: tcscamera.com, thecamerasource.com, bananaboatcamera.com). Note 3: Many of these will stop using a name that has been exposed by resellerratings. Then they will change the look of the website, get a new catchy URL and continue scamming. if you do not find any reviews on resellerratings, Google the shop in question: search for ‘(Storename) scam’ or ‘(Storename) bait & switch’ and you might find out more. Note 5:if you still cannot find anything about the store, do yourself a favour, shop at a well-known store, or even better: support your local camera store (or the local flag vendor above), where you get personalized advice and complain in person if anything is wrong.